Our standard business cards are printed on 350gsm silk board, printed using the latest digital production press - offering outstanding quality & fantastic turnaround times, usually offering next day shipping! Fantastic plastic, like your cards to have a laminated feel - then these laminated cards are for you! 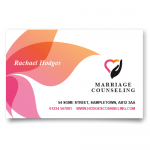 350gsm business card with either a matt or gloss laminated surface. More bang for your buck - these cards are more durable with the laminate surface offering a thicker feel & won't scuff. We offer our business cards in boxes of 125 & with prices starting at £25 they offer brilliant value. You can upload your word, publisher & PDF files in our upload section - guide templates are available in a variety of formats. Once you upload or email your file we will send you a proof back via email. Our standard business cards are printed on 350gsm matt, gloss & uncoated board, printed using.. 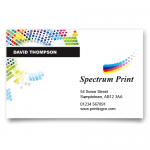 If you are looking for a card with a bit more substance, than look no further than our 400gsm pre.. Fantastic plastic, like your cards to have a laminated feel - then these laminated cards are for ..